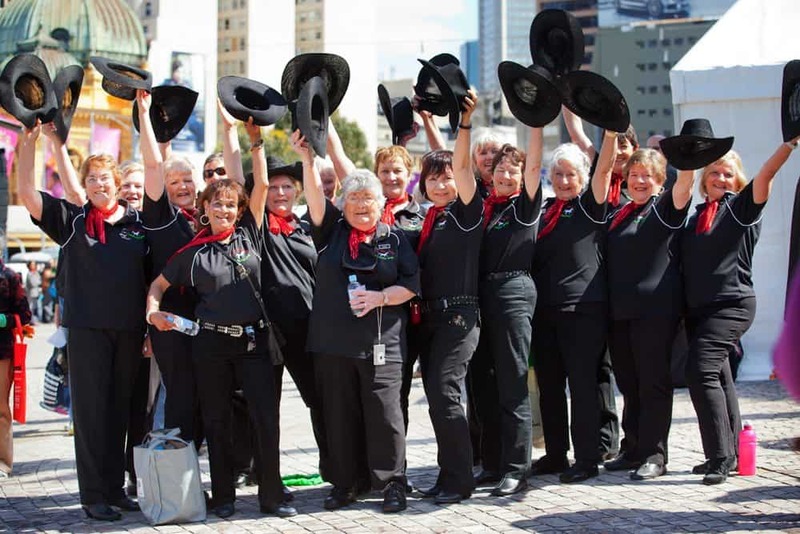 The Victorian Seniors Festival is an event to honour seniors in Victoria – held in October every year at various locations around the Melbourne CBD. This week-long festival includes an array of events, activities and entertainment for all seniors. The festival is organised by the Victorian Department of Health & Human Services to encourage seniors to get out there and participate in and enjoy a wide range of more than 1,300 activities; all generally free or low-cost. Free and low-cost events and activities will be presented across Victoria, including concerts, dances, theatre shows, celebratory morning teas, tours, a host of indoor and outdoor recreation activities and much more. Popular musicians and bands also come here to perform and entertain guests. Show off your younger side and dance to some of the great tunes of yesteryear, take part in many activities and participate in various workshops held during the festival, or why not catch one of the classic films. You can enjoy a multitude of interactive activities; such as dancing, aerobics, strength training and tai chi. Not just contained in the city, events can also be found all over Victoria with local councils and community groups running hundreds of other fabulous events. There is typically free public transport during the Seniors Festival. In order to access the free public transport, simply carry your Seniors myki and Victorian Seniors Card with you on public transport, and touch on and off as usual. You won’t be charged. 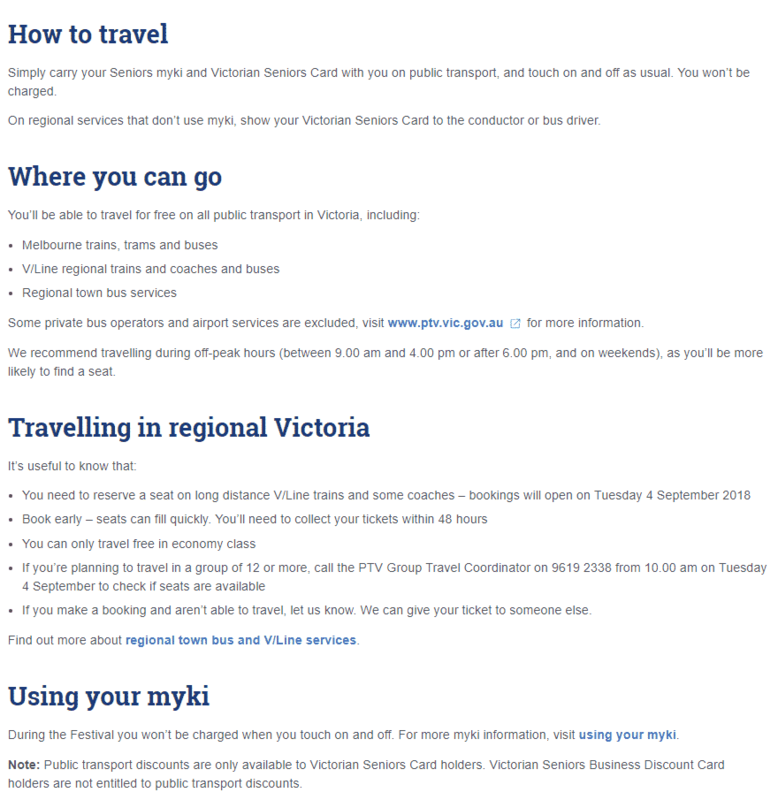 On regional services that don’t use myki, show your Victorian Seniors Card to the conductor or bus driver. Based on the program that was released for 2018, the special for Gumbuya World is entry to the park anda wildlife walkabout tour that is conducted by experienced park rangers – for the price of $14 (which is excellent value since the regular senior’s price is $43, and what is included below). Please see the page numbered 83 on the guide at https://www.melbournepoint.com.au/wp-content/uploads/2018/08/Part-3-Statewide-orgs-and-Celebrations.pdf, or you can also see more detail at https://gumbuya.com.au/seniors-special/. It does mention that bookings are essential by calling 5624 9888, or emailing [email protected]. Looking at the official program, it does in fact state that the event on October 10 at the Capital Theatre in Bendigo is free. Whilst, the Capital Theatre website at https://www.thecapital.com.au/arts-culture-theatres/event/victorian-seniors-week-concert-bobby-darin-tribute-show mentions the tickets are $8 each. With the fact the date and times match, I am more inclined to believe the Capital Theatre in that the event will be paid. Is the Melbourne Zoo participating in the Seniors Festival this year & if they are, what will the dates be? No information is available as yet. However the Seniors Festival runs between 7 October to 14 October 2018, so any competitions/offers will be scheduled between these dates. Check back with us and I will update the page with new information as it comes to hand. I have checked the official Victorian Seniors Festival and also the Melbourne Zoo websites and i can’t find any new information. It’s noted that there is a deadline of 7 September 2018 for any places that wish to participate in the festival, so i don’t think there will be much information until this date has passed and things are confirmed. I have just searched through the 2018 festival program that has been released online, and i couldn’t find the zoo mentioned once. Additionally, i have checked the Melbourne Zoo website and can’t see anything there either. So unless they are still yet to lodge their application by the 7 September 2018 deadline, it doesn’t look like they are participating. You’d think an organisation of that size would have everything sorted out, so i don’t think it’s likely. Dates are not yet confirmed, but PTV has announced free public transport between 7-14 October 2018, so I assume it will align with these dates. Will the Windsor Hotel be holding their High Tea for Seniors week at half price again? We travelled from Ballarat on the free rail and had a fantastic time in 2017. I believe you have to book in early for this event. There will eat least 10 ladies interested in going again. I am unable to find the answer for you, so I suggest you contact the Windsor Hotel directly on (03) 9633 6000. They will be able to assist you with your query and take a booking if necessary. What is the date of Vic seniors week ? As noted on our page, the dates for the 2018 Seniors Week are yet to be confirmed. It typically runs throughout October each year, so check back with us for the full program and free travel dates. We will post updated information once it is announced. Is Smart bus route 901 free during seniors week? Victorian Seniors Card holders can explore Melbourne and regional Victoria with free travel from 8 to 15 October 2017. This covers all public transport in Victoria, including: Melbourne’s trains, trams and buses as well as regional trains, coaches and buses (including regional town buses). Seats must be reserved on long distance V/Line trains and some coaches. Free travel is only available in Economy Class. Seniors need to carry their Seniors Myki and Victorian Seniors Card with them on public transport, and touch on and off as usual. Myki fares won’t be charged during the Seniors Festival. Head to ACMI at Federation Square for some great films. Films include La La Land, Heaven on Earth, Dough, The Brand New Testament, Beginners, The Country Doctor, Where Am I Going? and The Light Between Oceans. Call 8663 2583 for booking and screening times. Tickets are $5.00. Have a great time at the Seniors Festival! I’m from Gippsland. Have they got a program for the Gippsland areas? You can search the online Victorian Seniors Festival Event Guide here for your regional events. Simply select your location and the range of events scheduled for your area will be listed. Have a wonderful time at the Seniors Festival 2017! Hi, we didn’t receive the booklet of seniors citizen this time , from where it can be available? Here is a link to the online Victorian Seniors Festival Event Guide. Can my husband and I use v line to Swan Hill and back on the 10th and 11th October in Seniors week? Yes, you can travel from Swan Hill and back. You need to reserve a seat on long distance V/Line trains and make sure to book early, as seats will fill quickly. You can travel for free in Economy Class only. To book a seat, call 1800 800 007 from 10am on Tuesday 5 September. Hi we have used this one in the other direction. For a few dollars you can upgrade to first class, well worth it. (we did but it was a few years ago). When does the Seniors Week commence and end? The State Government states “The 2017 Victorian Seniors Festival will take place throughout October”. They are yet to confirm which week in October. Check back with us and I will update our page once further information comes to hand. The State Government will provide 8 days of free public transport for Victorian Seniors Card holders in metropolitan and regional Victoria for the period – Sunday 8 to Sunday 15 October, 2017. The free public transport is a feature of the Seniors Festival every year. However I suggest you contact the organisers at [email protected] if you want to confirm those dates for 2017, as I cannot independently confirm those dates at present. Full details haven’t yet been announced, but in previous years the free travel coincided with the seniors week festival. So the free travel should occur on 8-15 October 2017. When is free transport available? Unfortunately the free public transport offer for Seniors Week 2016 is finished – The State Government provided 8 days of free public transport between 2-9 October 2016. However I do note that Seniors receive free weekend travel on Metro services as part of the standard service. You still need to touch on and touch off, but Seniors with a valid Seniors Myki card will get free travel within any two adjacent zones (for example, Zones 1 and 2) in Victoria when you touch on and touch off. Just make sure to carry your Victorian Seniors Card with you when you travel. I understand there is a Wurlitzer Organ program at 985 Nepean Hwy, Moorabbin on Wed 25th Oct. Would you please advise the time. It is scheduled on Wednesday 26 October 2016 2pm – 3.30pm. I have attached a link to the event here. Have a great time at the Seniors Festival 2016! Is there an antique display at the Melbourne Town Hall during seniors week? If so, at what date and time? I have checked the program and unfortunately I cannot locate any antique display at the Melbourne Town Hall. Here is a link to the full program, so have a browse and hopefully there are some other free events to pique your interests! Can seniors from interstate access the fee transport and concerts if in Melbourne for the week? According to Seniors Online Vic, the free transport offer is only available to those with a Victorian Seniors card. So unfortunately the free travel wont apply for interstate seniors. However many of the events during this period and free to attend and no bookings are required. So you will be able to access the concert in Federation Square as well as many of the other free events. I believe the booklets are available at Coles Supermarkets. Have a great Seniors Week. Thanks for the great tip Vicky! I am so net tested in travelling from Melbourne to Ballarat on 2 October. Would this be free? If so, do I need to book, or do I just turn up? The free VLine travel starts on Monday the 3rd of October and runs until Sunday the 9th of October 2016 (not including Friday 7 October). Not sure why this is the case, as travel on the metro services for free starts on the 2nd of October. Click here for more information. So in your case, from the 3rd of October, travel is free between Melbourne and Ballarat and you don’t need to book. So just show up for trains or buses travelling between Melbourne and Ballarat with your Seniors Card. Do I have to book to travel between Melbourne and Bendigo during Seniors week as coaches are running in place of trains. It appears that no, you do not have to book to travel from Bendigo. I have attached a link here for you which gives further information about the free travel available during Seniors Week. If we want to use the v-line option and travel to Morwell from Ballarat, where do we book this for the Seniors week? Or can we just go to the v-line office in Ballarat ? It appears you don’t have to book for tickets departing from Ballarat. Here is a link to some more detailed information about travelling during seniors week. Can you please advise where I am able to obtain copy of 2016 Victorian Seniors booklet of events? I am not aware if there is a book this year. I suggest you email the organsiers at: [email protected]. Hopefully they can assist you further. By when do I have to have information to you to be included in printed program booklet of events? You can browse through the schedule of the events here, or you can pick up a copy of the festival program from any town hall or community centre near you.